Didn’t most of us start out collecting Matchbox, or later Hot Wheels, die-casts? I spent a lot of time ogling and dreaming about those 75 metal 1/64 (roughly) scale Matchbox vehicles in my hobby shop’s display case. And when really lucky, I snagged a catalog. They were affordable, and a load of fun to play with, even before they developed better wheels. 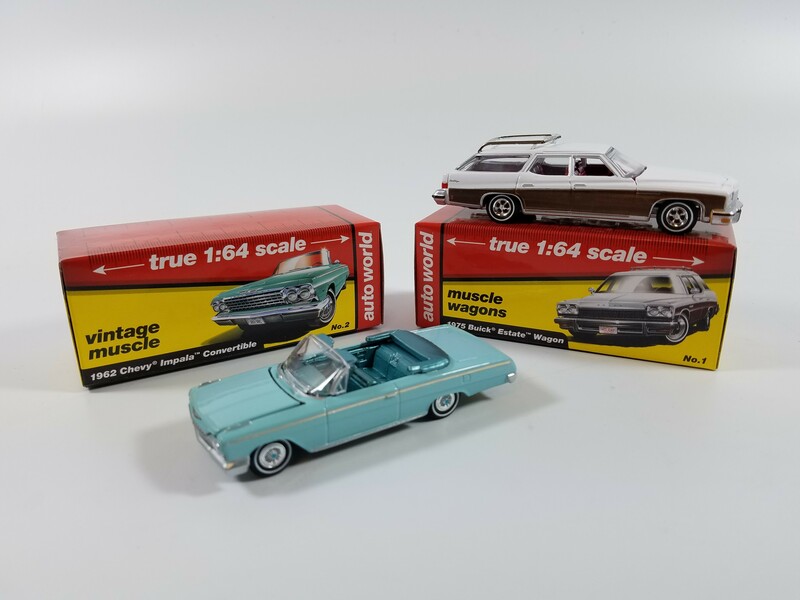 Well, Auto World, a die-cast arm of Round2 has cranked out another stunning 6-pack of its “true 1/64 scale” cars, just before the holidays. We visited Round2’s northern Indiana offices recently to eye-ball a bunch of its latest creations. 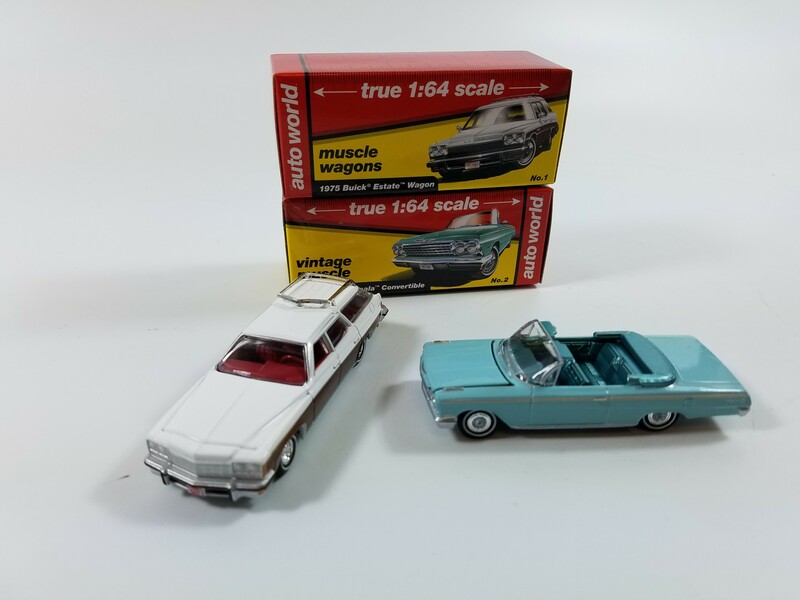 I’m partial to 1/64 and smaller scales, so this 6-pack is right up my alley. 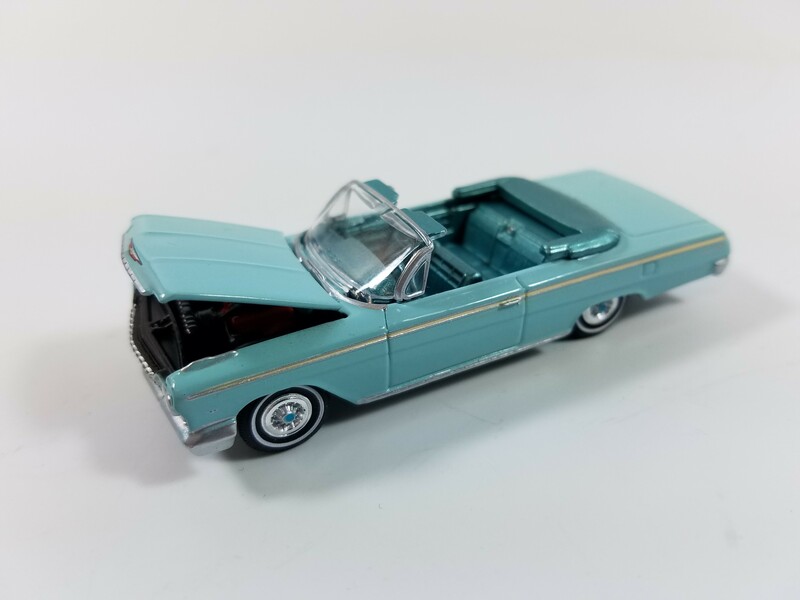 It includes two new tool cars, the beautiful 1962 Chevy Impala Convertible in Twilight Turquoise, and a 1975 Buick Estate Wagon in Arctic White, but with cool wood-look side panels. The work here is stellar for this scale. I grew up in an Indy neighborhood thick with 1960s Chevys. We had a ’55, but the neighbors had a ’63 Impala convertible and this Auto World ’62 brought back memories of that car. I love the light blue (turquoise) body with slightly darker blue interior. Being a convertible, you get to see the nice detail on the interior too. The seats are textured as in the real car and the large steering wheel is a slick 2-spoke reminiscent of the early ‘60s. You can even see the gauge cluster, a couple radio buttons and a textured glove box door. Interior door trim is complete too with molded in window cranks. Outside the silver accent trim is well executed and chrome strips along the rocker panels also accentuate the car’s long, lean lines. Grille, bumpers, head and taillights also are sharp as are the wide Chevy logos on the hood and trunk. An Impala logo with the leaping creature also graces each rear quarter panel. One more thing, the hood opens to reveal a matte black engine compartment, orange Chevy V8 with a black air cleaner on top. Again, surprising detail for 1/64. The Buick, a beast of a wagon, is equally well detailed, including a chrome roof rack, Buick imprints nose and tail, side markers on the giant 5-mph compliant bumpers and that wood paneling look that looked so fake, but retro cool now, on the real car. Tires are rubber, treaded and white sidewalls on both, with the Buick sporting racy looking 5-spoke chrome wheels. – A snazzy dark blue and orange-trimmed 1965 Ford GT40 (No. 12) with racing decals and Gulf livery markings. Did you know Grady Davis, the vice president of Gulf Oil Corp. in 1967 was the first to own a GT40? Neither did I! But that little factoid is printed on the impressive hang card that holds the car. All of the pack’s cards feature similar fun info. A lot of work goes into the packaging here! – A Bright Lime 1972 Ford Mustang Mach 1 with flat black spoiler and hood with giant air scoops, and a black racing stripe and Mach 1 tampo-printed logo on each side. Even the tires are branded as Firestone Wide Ovals to give the car a racy appeal. – A Verdoro Green Poly finish with flat black roof makes the 1969 Pontiac Firebird sing. Again, it’s beautifully accented with silver wheel well and rocker panel trim. – Less exciting to me, but still well executed is the Cotillion White 1976 Cadillac Coupe DeVille with red landau top. My choir teacher, who was rather flashy, drove one of these. Again, good model markings and interior detail. All the cars’ hoods open to reveal an engine, save the Ford GT40, but you can see it’s engine through the back window. 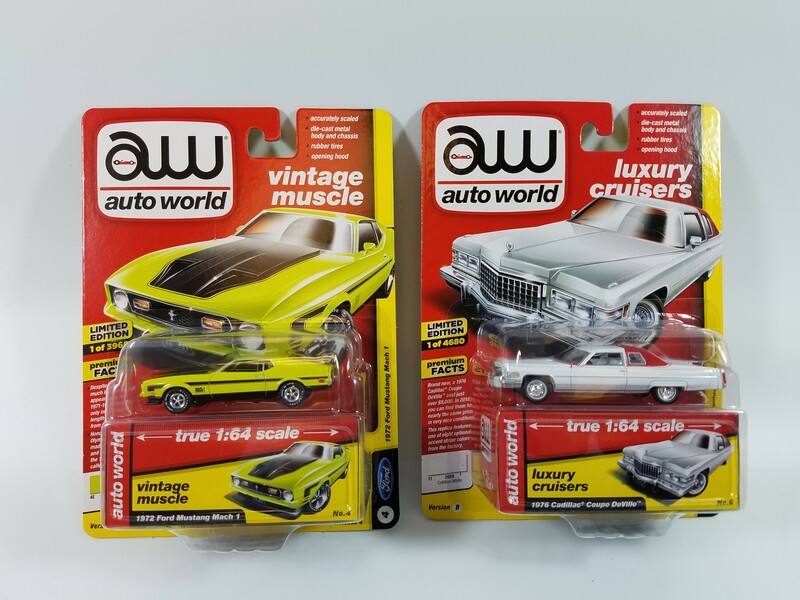 Auto World’s Premium Series 6-packs are an impressive lot, coming to just $7 a car. That makes collecting in this scale a bargain, yet you still get oodles of detail, not just a snazzy paint job and flashy, fast, wheels. 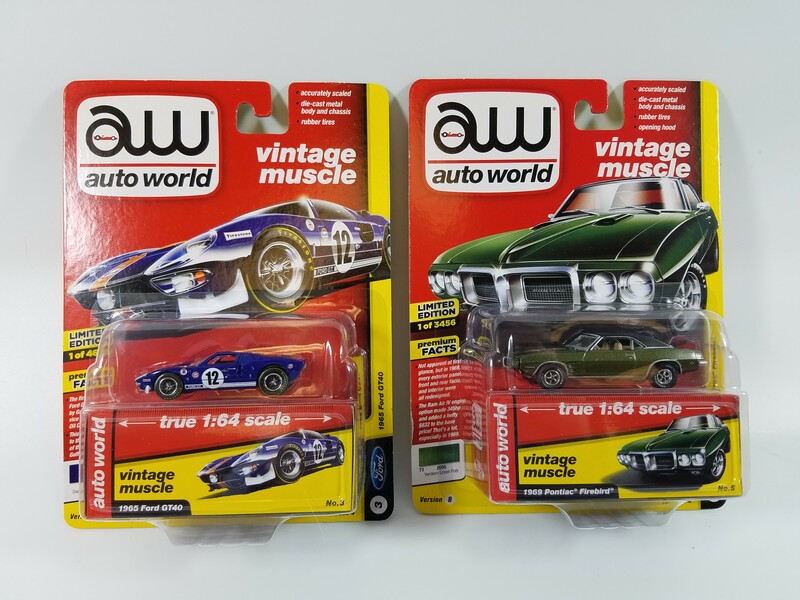 This was set B, as each 6-pack release comes in two possible sets including the same cars, but each painted differently from the other set. Cool!